Plated and coated copper-core wire offers a bounty of appealing characteristics. Even if you skip the colored craft wires and stick to alternative metal colors like gold, silver, copper, and brass, there are many advantages to using plated copper-core wires over solid metal wires, such as pure copper and pure (fine) or sterling silver. Price: This one nearly goes without saying, but it’s great to get the look of silver, gold, or rose gold for less money. Familiarity: In addition to inexpensively achieving the look of silver, gold, and rose gold, I also appreciate knowing what is under that plating. Having a copper core in the wire (as opposed to who knows what) allows me to work with a metal that I understand, whose habits and behavior I’m familiar with. In a pinch, I recently bought some wire at a craft store that was simply labeled as copper, but when I got it home, it didn’t work for electroforming, and I learned later that it wouldn’t ball up or turn color in the flame, no matter how long I heated it. There’s no telling what base metal that wire is actually made of, and it’s useless in the two techniques for which I bought it. On the left is solid brass wire. I wasn’t able to draw a decent ball on the end, it stayed pointed, but it kept its color well and hammered nicely. In the middle is fine-gauge silver-plated copper-core wire. It drew a nice ball and hammered beautifully. You can’t see the copper core in the hammered end, but on the larger-gauge wire of the same kind on the right, the copper did show through just a tiny bit on the end, though you can’t see it in this photo. You can see the flame coloring on the wire, however. Variety: There are many options available in plated copper-core wire. Round, square, and half-round can be found in any gauge from 12 to 32 in silver-, gold-, and rose-gold-plated, as well as other alternative metals and metallic colors like antique and natural copper, blue and stainless steel, hematite, bronze and vintage bronze, gunmetal, and titanium. There are dozens of bright colors as well. These options allow for the variety of color and metallic finish but in a wire that behaves consistently. Speaking of behavior . . . Behavior: Because plated copper-core wire has, well, a copper core, it behaves much like copper wire while maintaining the look of more expensive metal. You can ball the ends of plated copper-core wire in a flame just like you would solid copper wire and then make balled or flat head pins or hammer the ball ends flat for paddle-shaped ends. (Note: Sometimes plated copper-core wire smokes when I torch it, so I’m always careful to do it in a well-ventilated room. Never skip the smart safety guidelines! The fire scale on the remainder of the wire can be removed just like you would remove it on any other wire or metal. I especially love balling the ends of silver-plated copper-core wire, quenching it quickly so the ball is bright shiny pinkish red, and then cleaning up the rest of the wire so it’s bright silver again. Those pinkish-red balled ends make especially pretty tips on rose-gold-plated copper-core wire. On the left is a medium-gauge half-round copper-core silver-plated wire. It’s a dream to work with and even hammered flat prettier than its round cousins did. In the middle is a large-gauge solid copper wire. I love the colors it takes from the flame. On the right is a tiny piece of 28-gauge fine silver wire. It made more of a spiral than a coil and I couldn’t draw a ball on the end because it kept burning off. That’s definitely an instance in which copper-core silver-plated wire would be better. Forgiving: Usually the copper core stays hidden under the plating, but if you have an incident where the copper core shows through on your gold- or silver-plated (or even colored) wire, Leah Helmrich suggested a great fix in her Blossoming Lotus necklace project on the cover of The Best of Step-by-Step Wire Jewelry 2012. Simply use Krylon metallic leafing pens (silver, gold, or whatever color you need) or paint pens to dot the exposed wire ends and hide the copper core. Bonus: I use ParaWire craft wires. I love the fine-silver-plated copper-core wire with a nontarnish coating–it always looks fabulous and shiny. I learned at Bead Fest last year that they now have new silver-filled wire with a brass or copper core that is bonded in such a way that you don’t see the core when you cut or flatten it. Brilliant! On the left is the mystery craft-store “copper” wire that wouldn’t ball up on the end no matter how long I left it in the flame, it just burned. It hammers well though and no core metal showed through, whatever the core metal might be. In the middle is medium-gauge copper-core rose-gold-plated wire. Forgive the glare but it keeps its pretty rosy color after hammering and torching, and it drew a fine balled end thanks to the copper core. On the right is a small-gauge pure copper wire with that pretty red balled end I like so much. 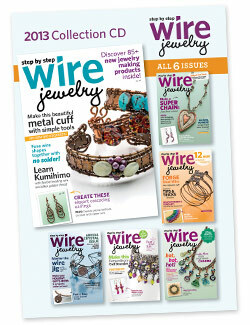 Learn more great ways for using all kinds of metal wire–coated craft wire, plated copper-core wire, or solid metal wire–in the best projects and tips of the year from Step-by-Step Wire Jewelry magazine. You can get the entire year of 2013 issues on one convenient space-saving collection CD–or you can instantly download the collection, too! Advance your skills as you uncover step-by-step directions, must-have tools and supplies, and basic metalsmithing information that will take your jewelry to the next level! • Discover step-by-step pictures and directions to guide you straight to making beautiful jewelry. • Skip the guesswork with detailed material lists so you can mimic the featured projects. 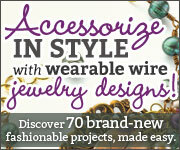 • Uncover the hottest wire jewelry tools and supplies you’ll be dying to try for yourself. • Explore 65+ stunning projects in a variety of techniques and in every level. Also available as a collection download! ©2014 F+W Media, Inc. All rights reserved.